Collection agents are individuals or businesses that collect debts for other parties. They have no special legal powers to collect from a debtor, but their aggressive tactics can make them difficult to deal with. A collection agent is trying to collect on a bill that the client says is not owed. A collection agent is harassing the client by making repeated telephone calls to them at home and work. A collection agent is threatening legal action against the client. Collection agents are in the business of collecting debts for other parties. They have a reputation for being the most aggressive people in the credit industry. This reputation comes from their tactics. when maintaining goodwill with the client is not a factor. Collection agents usually take over a creditor’s claim by way of assignment. This means the creditor “sells” the claim to the agent. The claim is usually assigned in exchange for a promise that the agent will pay the creditor a certain percentage of any amount collected. Collection agents will try to collect through direct contact with a debtor (often by phone), but rarely through the court process. Section 121 of the Business Practices and Consumer Protection Act prohibits a collection agent from bringing a legal proceeding as a plaintiff against a debtor without giving the debtor notice of the assignment of the debt by the creditor to the collection agent, or without giving notice that the collection agent intends to bring the proceeding. Collection agents must be licensed under the Business Practices and Consumer Protection Act. Consumer Protection BC is responsible for issuing, cancelling and suspending licences. A collection agent has a right to appeal such a decision to the courts. Consumer Protection BC regulates the collection notices used by collection agents. The Business Practices and Consumer Protection Act defines collectors as employees of a collection agent, and makes the collection agent liable for any damage done by any collector (see the section on Bailiffs, Court Bailiffs and Sheriffs). By regulation, the licensing provisions do not apply to lawyers, employees of banks, trust companies or credit unions, or sheriffs and court bailiffs. When assisting a debtor with a claim by a collection agent, gather and confirm all information on the financial circumstances of the client, including income and expenses, assets and debts, and future prospects for changes in income. For a specific debt, confirm the details of the collection agency and the creditor who assigned the debt to the agency. Information gathering should include obtaining sufficient details to make an assessment of the debtor’s liability and the amount owed. Consider, for example, if the debtor might have a defence to the claim if the matter were brought to court by the collection agent. It may be useful to have the debtor prepare a written account of the number and content of the contacts the collection agent has made. Advise the debtor to keep a record of future unwanted contacts by the collection agent, though reasonably quick action to solve the problem may ensure an end to such contacts. 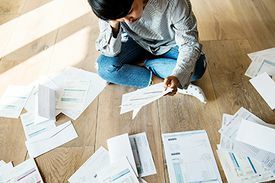 In general, carefully review the entire financial circumstances of the debtor — the fact that the client is having problems with a collection agent may well mean they are facing financial difficulties with other creditors as well. There are several aspects to resolving a debtor’s problem with a collection agent. The immediate concern will probably be putting a stop to unwanted contacts by the agent. Even where a debtor is clearly liable on a debt, the law does not allow any creditor, including collection agents, to pressure a debtor unreasonably (see the section on Harassment by Debt Collectors). It may be difficult for the debtor to act on their own under these circumstances. Intervention by an advocate or lawyer may be more effective. Consider hand delivering a letter or sending a registered letter to the collection agent outlining the debtor’s circumstances along with a proposal for resolving the claim. Make it clear if the claim is being denied (in whole or in part). It is unlawful for a collection agent to continue to try to collect a debt if the debtor has notified the collection agent and the creditor that the debt is disputed and the debtor wants the creditor to take the matter to court (see section 116(4)(c) of the Business Practices and Consumer Protection Act). You must make it clear that the debtor does not want further direct contact. In the past, the government directed that collection agents must not try to collect from debtors who are currently on welfare. A quick and effective way of stopping agencies from repeatedly contacting such clients can be to contact the collector in writing and inform them of the client’s status (perhaps enclosing a copy of a cheque stub), asserting that the client has the right under the Business Practices and Consumer Protection Act, section 116, not to be contacted, except in writing, and advising the collector that a complaint will be made to Consumer Protection BC if there are further unnecessary contacts. The advocate should propose that the client will update the collector about their financial circumstances at reasonable intervals (for example, every three months). If a collector continues to phone a debtor after the debtor has requested to be contacted in writing only, the debtor might contact Consumer Protection BC for help, letting the collection agent know that such a complaint has been made. This is usually enough to stop the pressure. It may also be in the public interest to make such a complaint, as Consumer Protection BC may take steps to revoke the licence of a collection agent if there are a number of complaints. A broader concern in these cases is the overall financial picture of the debtor. Consider if there are other creditors who ought to be dealt with at the same time. Consider the short-term and long-term financial circumstances of the debtor and what remedies are most appropriate. If the collection agent has been particularly persistent, the debtor may wish to take legal action. There are a range of causes of action that might be brought. Such actions usually require legal advice. Regardless of the degree of persistence, consider carefully with the debtor if they wish to undertake such litigation. Often, debtors are relieved just to resolve the financial problems and have little desire to seek further redress. See also People’s Law School’s page on dealing with debt collectors.